Why does merely understanding and trying hard to follow the example of Jesus often yield little progress-and even less joy and peace? Deriving insights from the life of Jesus in the Gospels, Klaus Issler uncovers the dynamics involved in truly becoming more Christlike. He shows how you can forge much deeper connections with Jesus so that his life permeates your own character. The result is a closer alignment between what you want to do as a follower of Jesus, what you actually do and who you are becoming in your relationship with him. Learn to be transformed from the inside out. 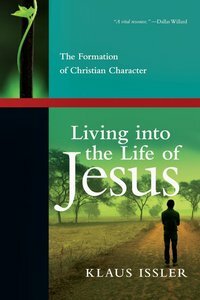 About "Living Into the Life of Jesus"
Klaus Issler (PhD., Michigan State University) is professor of Christian education and theology at Talbot School of Theology, Biola University, La Mirada, California. He is an adjunct faculty member for the Institute of Spiritual Formation. He teaches primarily in the Ph.D. in Educational Studies program, and is the book review editor for the Christian Education Journal. Dr. Issler authored Wasting Time with God: A Christian Spirituality of Friendship with God, The Lost Virtue of Happiness, Getting Good at Life: Experiencing Kingdom Living Now, and co-authored Teaching for Reconciliation: Foundations and Practice of Christian Educational Ministry and How We Learn: A Christian Teacher's Guide to Educational Psychology. He has contributed to Baker Dictionary of Christian Education and Christian Education in the New Millennium. Dr. Issler has been an associate pastor, an instructor for Walk Thru the Bible, and a board member with BEE International, most recntly he has authored In Search of a Confident Faith with J.P. Moreland.